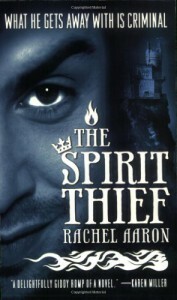 The Spirit Thief suffers a bit from first book in a series syndrome. While I enjoyed the characters, I didn't learn much about them. While I thought the magic system and world building was original and interesting, we never delve deep enough into it's history and origins. I ended up feeling like I read 'fantasy lite' and not the richly engaging story it had the potential to be. I hope that as I move deeper into the series this feeling resolves itself, but at the moment I'm not hooked enough to move directly on to book 2.